Network-attached storage (NAS) is a dedicated hard disk storage device that is set up with its own network address and provides file-based data storage services to other devices on the network. A network-attached storage device is attached to a local area network and assigned an IP address, allowing both application programming and files to be served faster because they are not competing for processor resources. 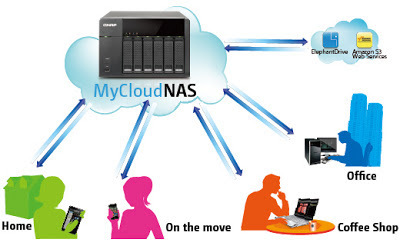 NAS devices are usually configured with a web browser and do not have a keyboard or display. Why Choose Network Attached Storage (NAS)? External Hard Drives are a great way to quickly and conveniently create additional storage via a simple USB connection to your computer. However such devices are often restricted to use at the specific computer to which they’re connected and by the specific person using that computer. All good and well, but what if you need to share the content and files? The answer lies in Network Attached Storage. Instead of connecting directly to an individual desktop or laptop computer, a NAS server connects to your wireless router. This effectively allows multiple users from multiple computers to access and share the content and files stored on it. Just one copy of your files, in one accessible place!